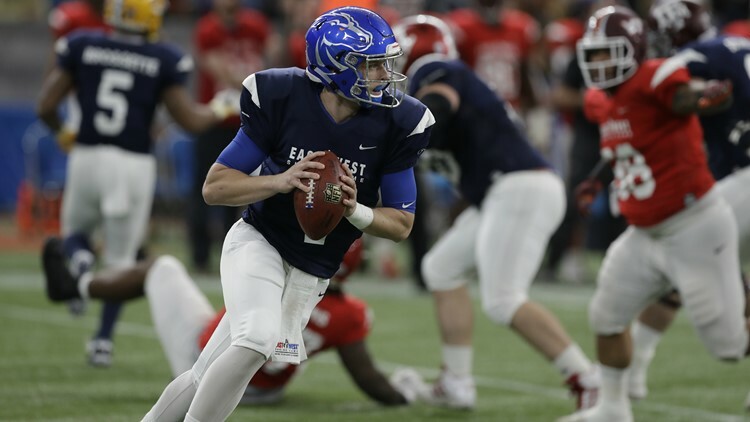 West quarterback Brett Rypien of Boise State rolls out during the East West Shrine football game Saturday, Jan. 19, 2019, in St. Petersburg, Fla.
BOISE, Idaho — Friday, April 12, 2019. Boise State’s Brett Rypien is the trendy pick for “Most Overlooked Quarterback in the 2019 NFL Draft.” Bleacher Report's Maurice Moton is in that camp and looks at him this way: "Rypien isn't going to wow anyone with his arm strength or mobility, but he checks multiple boxes with his intangibles.” Moton adds that Rypien has the "three P's" in his favor—preparation, pedigree and pro-system success. PFF Draft has some nitty gritty: “Brett Rypien was MONEY on crucial downs this season: he had 15 big-time throws, a 12-to-1 touchdown to interception ratio, and a 113.9 passer rating on 80 3rd and 4th down completions!” Bottom line: it indeed appears he’ll be the first Bronco QB ever to be drafted in the NFL’s seven-round era. For a counterpoint of sorts, we go back to Lance Zierlein of NFL.com: “Light on measurables, but high on intangibles, Rypien's lack of size, mobility and NFL arm talent makes it unlikely that he'll ever become a serviceable starter. What has a chance to save him is his football intelligence, accuracy and consistency. He stepped right in as a freshman and proved he could not only survive, but thrive and grow. A troubling number of interceptions were due to lack of arm strength so he needs to find a timing-based passing game in order to find a home as a back-end backup.” My counterpoint to that last claim: Rypien’s arm strength was impressive at the NFL Combine, and the 10 pounds of muscle he has added in training for the draft cannot be underestimated. San Francisco Giants outfielder Barry Bonds catches his godfather, Willie Mays, for the number three spot on baseball’s career home run list. The suspiciously bulked-up Bonds deposited a pitch out of what is now Oracle Park and into McCovey Cove on Opening Day in San Francisco, the 660th homer of his career. He would pass Mays the following day and set his tainted sights on Babe Ruth and Hank Aaron.